1. Celebrate customers by providing extreme attention to quality of items and experience. 2. Reduce suffering by meeting the world’s needs too. 3. Connect with people by sharing my time, experience, and good cheer with the Etsy community. 4. Enjoy life by spending time creating and working hard. Her values for running a shop are moving and I will be looking to it as a source of encouragement for running my own boutique on Etsy. p.s. I love selling on Etsy because I feel I am a part of a supportive, sharing, and creative community and I get to meet fabulous, like-minded sellers like Lorna. 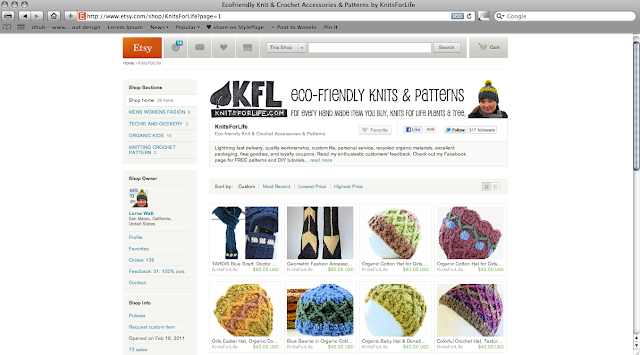 p.p.s Check out KnitsForLife.etsy.com for Lorna’s lovely and eco-friendly knitwear.